Charlotte Magazine's Kristen Wile gives readers the 411 on Bob's new gig at The Punch Room, The Ritz's new hot spot. 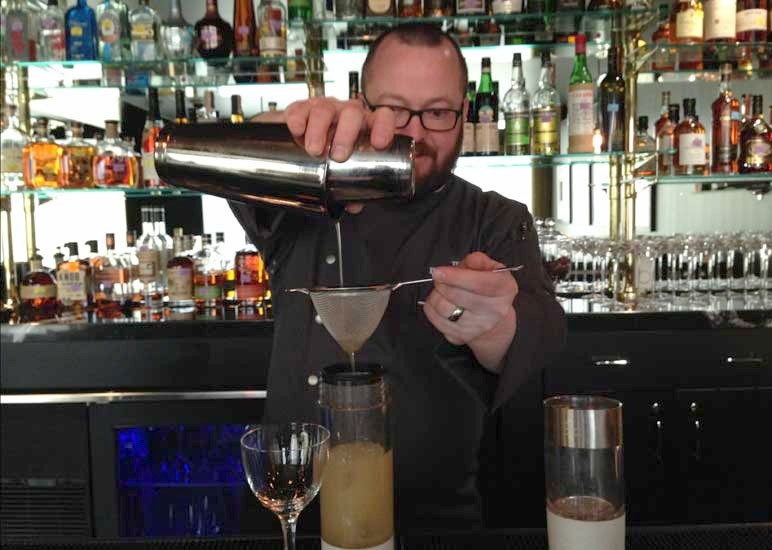 Bob Peters has more than 13,000 Instagram followers, most of them eager to keep up with the latest cocktails the mixologist has created. He’s earned nationwide recognition for his talent behind the bar. It wouldn’t have been a surprise if one of Charlotte’s biggest names in the bar scene decided to move from Pisces to a bigger city. This is Peters’ city, though, and instead of heading to New York or Chicago, he moved uptown to the Ritz-Carlton. His new home is The Punch Room, which replaced the Ritz’s Urban Sip. It opened this past weekend on the 15th floor of the hotel. Decorated with luxe fabrics in black and gold with a view of Charlotte, the latest iteration of the lounge is more sultry than the wine bar before it. There’s enough seating for only 37 people, which means those who are waiting for a seat will queue up in the Ritz lobby until patrons leave. That will keep The Punch Room from becoming too crowded, and it will give Peters the time to craft each cocktail. Meanwhile, a “punchologist” will create the punch bowls (although Peters says he will taste and approve each one). This entry was posted in Press and tagged Bob Peters, bob the bartender, bobthebartender, Charlotte Magazine, charlottemagazine.com, punch room, punch room ritz, the ritz, the ritz charlotte.